ABDC = Apple Butter Doodle Cookie. 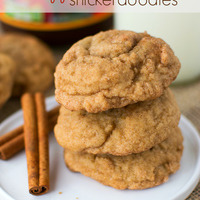 A soft and buttery snickerdoodle cookie with the goodness of Apple Buttah baked right in. Derived from Snickerdoodle Cookie by ID10-T.
Well rounded and pleasant ADV. The recommended 2 week steep is key to this recipe. Mix a bottle, thank yourself and ID10-T later! (2)Just had a buddy trade me a 30mL of this mix out of his personal batch, and wanted to say again how awesome this is! The apple/cinnamon taste/texture combo here is addictive as heck, and this is definitely my favorite FA Fuji recipe. This one has has made it into a shortlist of rotations and is a favorite of a friend who has it in all his tanks. The image chosen to represent this juice makes it look like it might be a bit dry but don't be fooled. It does have a nice apple filling that keeps you coming back for more. I tried to find something in this recipe to whine about. I really did. I mean, it has three ingredients that could be trouble: CAP CDS with the metallic sour note, TPA VBIC and the spice, and FA Fuji with harshness and overpowering-ness. No trouble whatsoever. Really nice. A great addition to a sugar cookie base. I like how balanced and integrated the actual apple manages to feel and taste here. Just enough punch without crossing into something distractingly strong. I've got to throw a bunch of heat at this to get over the sour note I get from CDS, but I'm inclined to think that is more my damage than a fault in the recipe. This is some good stuff! I love the fact that you were able to adapt my recipe into your own. You did an amazing job of adjusting certain flavors in Apple Buttah to allow this recipe to taste like a cookie that has apple butter mixed into the dough rather than a cookie with apple flavoring drizzled on top, if that makes sense. It's very buttery and soft just like advertised and the fuji plays well with the cookie element. There's just something about CAP Sugar Cookie that when added to bakery or dessert recipes just makes them that much better. Great job! Things I plan on trying with this recipe: increasing fuji since I really enjoy it and adding another cookie flavoring to see if I can get a bit more of a crunchy cookie taste. All in all, this is a fantastic recipe and I will be keeping this in rotation! Mixed this two days ago, and it's already amazingly tasty! Gonna have to whip up another batch so it can actually steep the recommended time.